Last week, all of our Year 9 students had an opportunity to test out their thinking power and inventive prowess in the first ever Vandyke Egg Challenge. 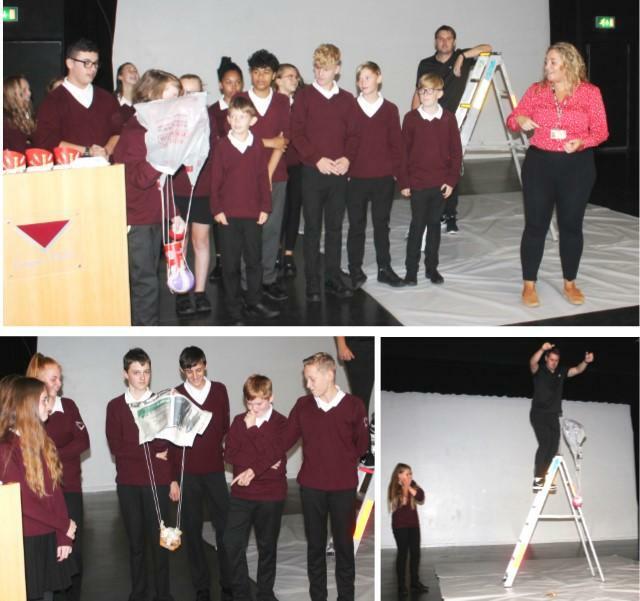 Year 9 students were given the task of independently creating a structure that would protect an egg from breaking from a great height – our tallest PE trainee, Mr Whitley, on the top of a ladder! The aim of the morning was to encourage students to adopt a Growth Mindset attitude. In teams, students were required to test their Leadership, Organisation and Communication skills to ensure their structure would protect the fragile egg. Students were only given limited resources consisting of recycling products, carrier bags and the odd balloon; students had to use great Initiative and Resilience in creating their final design. Teachers were really impressed with how students worked together to achieve an overall goal. Thank you to Mr Cooksey for providing near to 50 eggs, and to all teachers involved in facilitating this event. Congratulations to Mr Collier’s groups who achieved a 100% pass rate. Biggest thanks goes to all our Year 9 students who were brilliant throughout the entire challenge – A cracking morning!